Reading the Bottesford Methodist Chapel Roll of Honour - Great war of 1914. Restored and preserved as part of the Heritage Lottery Fund supported Bottesford Parish WW1 Centenary Project: People, community and memory. 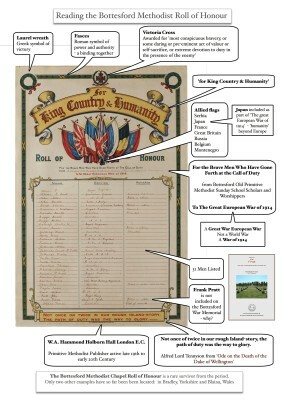 The Methodist Chapel Roll of Honour is the only local 1st World War memorial that lists both survivors and those lost. The two other Parish memorials identify those lost from Bottesford (29) and Muston (11). The aim has been to preserve this fragile document for another century. The 1980s frame was replaced and after remedial treatment it is now glazed with UV filtering glass. In contrast to the two war memorials situated in St Mary’s Church, Bottesford and outside St John’s Church, Muston, the Chapel Roll of Honour is not well known. Its preservation, permanent display and rededication in the Methodist Chapel on Devon Lane will enable it to be brought to the attention of the wider community. As part of its conservation a high resolution digital image is now available for use in publications and to facilitate further research into its content. We are currently researching the biographies of those named on the Roll of Honour. These will be published on this web site. It is interesting to note that one person listed as ‘Killed in Action’, Frank Pratt, is not on the official village war memorial in St Mary’s. We do not know why that is. A vigorous debate about where the Village War Memorial should be placed occurred at the end of the war. Some argued for memorials to be erected at each place of worship within the village. Others moved that a village memorial should not be associated with any particular place of worship. Nor is he named on the list of those who served that was found in the 1990s in St Marys Church. Both Frank and his brother Jack were living on the High Street in Bottesford with their grand parents according to the 1911 Census. They may have moved to a nearby community before the war and maintained their connection with the Chapel. Perhaps the family of Frank Pratt preferred him to be remembered in the place of worship where he was a member of the congregation. Further work is needed to establish whether he is commemorated on any other War Memorials. The content of the Roll is very interesting in terms of its symbolism and what is recorded. Published by the Primitive Methodist publisher, W.A. Hammond, High Holborn, London EC1, it clearly taps into a prevailing sentiment of the time that the War would be over by the end of 1914. It refers to a ‘European War of 1914’ and not a World War. The allied flags include that of Japan and not just those from Europe: Serbia, France, Great Britain, Russia, Belgium and Montenegro. ‘for King, Country & Humanity’. The inclusion of the Japanese flag signals something wider than any immediate European ‘humanity’. Both top and tail invoke notions of bravery, valour, duty. All is bounded with classical symbols of victory (laurel wreaths to the two top corners) and encompassed by bound laurels (‘fasces’ – the Roman symbol of power and strength through binding together). We know from a contemporary account of its unveiling in The Grantham Journal, 6th March 1915, that it was purchased by two brothers (Masters L. and D. King) whose parents (Mrs and Mrs S.S. King of Belvoir Road) were members of the Chapel Congregation. Presumably not an expensive item at the time. That may explain why so few of its type survive. It would have quickly dated and by the same token become disposable. Other Primitive Methodist congregations installed memorials, many of which were designed to include the full term of the conflict from 1914-1918. Apart from one entry added above the original top line by another hand it looks to have been written by one person who then add remarks on the right as circumstance changed. We are currently examining whether all those listed would have been enlisted by its unveiling in March 1915. This will enable us check whether the current Roll is the original item unveiled in March 1915. If any of those named on the Roll enlisted after March 1915 this document would have replaced the original. 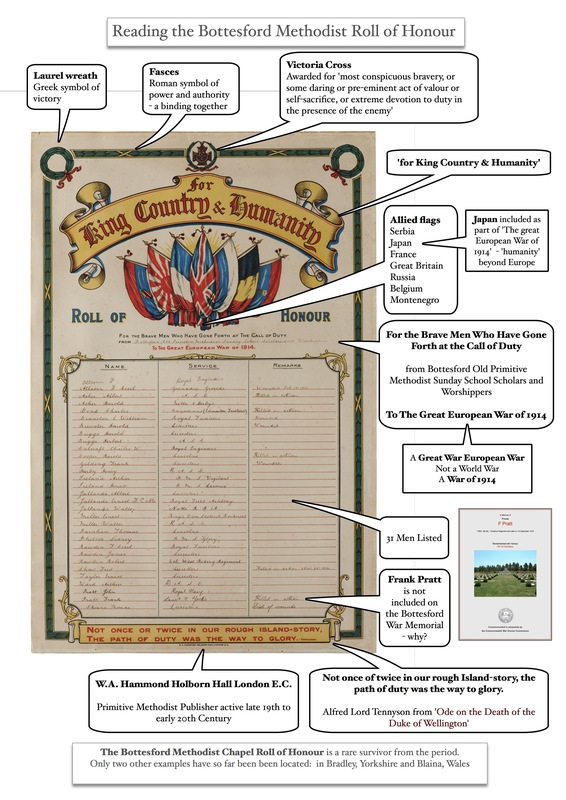 It could be that more than one blank Roll of Honour was purchased in 1914. Whatever the circumstances of its survival and conservation it will remain on display in the continued safe keeping of the Bottesford Methodist Chapel. There for all to read, remember and take forward the memory of those who served ‘from the Bottesford Old Primitive Methodist Sunday School Scholars and Worshippers’.